We keep helping people gain the smiles of their dreams with our palateless dentures, snap in dentures. 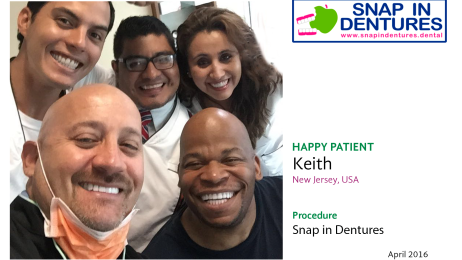 This time, we had our dear patient Keith from New Jersey who came exclusively to get mini implant dentures in Cancun. Snap in Dentures Happy Patient: Tracy’s testimonial review! We had a visit from our dear patient Tracy! She got Snap in Dentures last year and this time she gave us an amazing review and video to share with you! This is a great opportunity to let our patients speak and vouch for us. This time we had the privilege of helping our dear patient Mary from Florida to regain her confident smile. For a long time she had problem with teeth infections and didn’t like the way her teeth looked after so many treatments. She came looking for an alternative to the expensive implant dentures in USA. She had an estimate of $45~50,000 USD and that was simply out of her budget. This week we have a great case of Snap in Dentures to share with you. 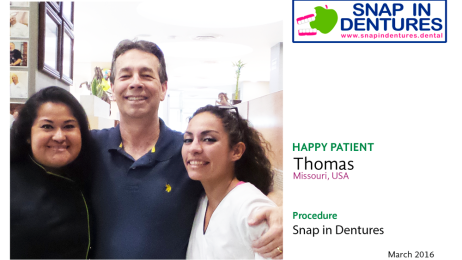 Our dear patient Thomas came from Missouri to get mini dental implants in Cancun while he was on vacation. He was so happy with the results he got in only 8 days that he did a video talking about his experience with us. He was specially delighted with the care of our dentists in Cancun. You can check the video here and also read a small transcriptions of his comments.